About 25,000 students are currently enrolled in Vermont's public colleges, and more than 18,000 attend private schools in the state. With more than a dozen schools to choose from, prospective students in Vermont may have trouble deciding which institution meets their needs. Especially designed for students looking for high-quality online programs that provide flexible learning, this page aims to aid aspiring students in their decision by answering their important questions regarding education standards, financial aid, and earning potential in Vermont. Both online and hybrid course formats are available through the distance education program at the University of Vermont. More than 40 full programs and over 400 individual courses are available to residents outside the state and locals who need the flexibility of online learning. Studies may culminate in a certificate or a full degree. Students are paired with career coaches and enrollment advisers to help them with the application process all the way through to graduation. Different programs have different graduation requirements, but all students can transfer incoming credits from eligible schools. Online education at Norwich University dates back 20 years, with some 93% of graduates recommending its distance education programs. Graduate students can choose from more than a dozen fully online master's degrees; there are also 6 online undergraduate degree programs as well as several certificates and continuing education programs. All online programs are designed for adult learners. Although graduation requirements vary by program, all courses and programs are taught by the same instructors who teach on the university's physical campus. There are over 60 fully online certificate, undergraduate and graduate programs available at Champlain College. Student's can earn an associate's degree in accounting, a bachelor's degree in business management or a master's degree in digital forensics. Some courses can be completed in a 7-8 week accelerated format. All classes are semi-structured, allowing students to reach deadlines on their own time. Academic and career advisors will assist you through your experience, and you can also participate in live webinars to answer questions regarding financial aid or your program of choice. Green Mountain College is committed to social and environmental sustainability, offering online degree completion for undergraduate and graduate programs in sustainable business administration, interdisciplinary studies, sustainable food systems, environmental studies or resilient and sustainable communities. Students move through coursework at their own pace, and depending on the number of courses transferred over, complete their degree in 2-3 years. Classes have a maximum of 20 students, and run for 6 weeks. Graduates have found work with a number of green-friendly employers, including Apple and the One World Conservation Center. How can I find which online colleges offer the degree I'm looking for in Vermont? No matter what level of degree prospective students want to earn, or what discipline they're interested in, the best way to find specific online programs is to look at the colleges' websites directly. Some schools, such as Norwich University, Champlain College, and the University of Vermont, have web pages devoted entirely to their online programs. Aspiring learners can start their search with a complete list of Vermont's colleges, found on the state's official website. Which online schools in Vermont will accept my transfer credits or work/life experience? Students in Vermont can often save money on tuition by translating their work and life experience into college credits. Each school can choose whether to award credits for prior work or life experience, but many in Vermont do offer this option for students. For example, Norwich University allows students with previous law enforcement experience or military work training to apply it as credit toward a bachelor's degree. Similarly, students at Champlain College who have completed professional development training can receive credits, and students in the Vermont State Colleges System can undergo an assessment process to have their professional experience considered for credit. How Much More Do College Grads in Vermont Make? Generally speaking, the higher a worker's degree level is, the higher their earning potential. Data from the U.S. Bureau of Labor Statistics (BLS) supports this correlation in the state of Vermont. The chart below illustrates the relationship between degree level and average income for Vermont workers. As the data indicates, as workers obtain jobs that require higher degree level minimums, their salaries increase. A report from Georgetown University's Center on Education and the Workforce project that by 2020, 65 percent of all jobs in Vermont will require some level of postsecondary education. At the moment, about 47 percent of workers in Vermont have at least an associate degree, according to the Lumina Foundation, meaning there is still a ways to go to meet projected employers' demands. Manufacturing jobs in Vermont are dwindling, as reported by the Agency of Commerce and Community Development, while industries such as healthcare are expected to surge. Because those industries tend to require their employees to hold degrees, workers should prioritize their education. Online schools in Vermont provide a convenient way for students to get their degree, especially if they are juggling work and family responsibilities. However, students shouldn't have to trade quality for convenience in choosing an online college. To ensure that they receive the quality education they need, students should only consider schools with the proper accreditation. 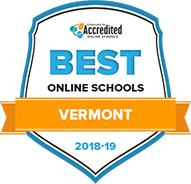 Colleges in Vermont—such as the University of Vermont, Vermont College of Fine Arts, and Goddard College—are accredited by the New England Association of Schools and Colleges Accreditation (NEASC). To earn accreditation from the NEASC, schools must undergo a peer review of their curricula and policies. In addition to NEASC accreditation, schools can also obtain specialized and subject-specific accreditation for their individual programs. For example, the Vermont Department of Education provides accreditation to teaching programs at the University of Vermont, while the American Psychological Association verifies the university's clinical psychology program. Moreover, the school's social work program is accredited by the Council on Social Work Education. The cost of education is a huge concern for students around the state, and it's no wonder: according to the U.S. Bureau of Economic Analysis, the average personal income of Vermont residents was $51,114 in 2017—up from $38,866 in 2007. This means many students have extremely tight finances, which might prevent them from paying to continue their education. However, as industries that require college degrees continue growing in Vermont, paying for higher education is becoming increasingly necessary. Out-of-state students are typically charged a significantly higher per-credit rate for attending college in Vermont, but those from Maine, Massachusetts, Rhode Island, Connecticut and New Hampshire may be able to qualify for in-state tuition rates through the New England Board of Higher Education Tuition Break program. This only applies for students who enroll in certain programs at participating schools. To find out more about paying for college in Vermont, continue below. What are Vermont's requirements to qualify for in-state university tuition? To save money on tuition, students from other states may consider establishing residency in Vermont. To do this, people must live in Vermont continuously for one year before starting school. They must also demonstrate community involvement by getting a state driver's license, paying state income taxes, or registering to vote. Are online credits more affordable in Vermont than other places? Keep in mind, some schools charge more in fees and lower tuition per credit for online students—be sure to understand the full cost of earning an online degree in Vermont before enrolling. How can I get help paying for online college in Vermont? Vermont residents may be eligible to receive financial aid from the federal government, their individual school, or from the state. To begin the process of winning grants and scholarships, students should fill out a Free Application for Federal Student Aid, or FAFSA, which allows schools to evaluate how much aid students can receive based on their household income. Armed Services Scholarship: This scholarship provides aid to Vermont's military families. Eligible students must be the spouse, child, or stepchild of someone who is active in the armed forces or who died during active duty. This scholarship is available to students attending the University of Vermont, Castleton University, Johnson State College, and Lyndon State College. Emily Lester Vermont Opportunity Scholarship: This scholarship is for students who have been in foster care. People must enroll in an accredited school in order to receive this funding. Sunrise Scholarship: This scholarship is for students from Windham County who demonstrate financial need and entrepreneurial skills. Vermont Retail and Grocers Association Scholarship: The children of people who work for a VRGA-member company can receive this scholarship. St. Johnsbury Rotary Community Service Award: Members of St. Johnsbury Rotary Club can receive this scholarship. Applicants must be graduating seniors from Hazen Union High School, Danville High School, or St. Johnsbury Academy. In addition to the above scholarships, the Vermont Student Assistance Corporation also provides grants for full- and part-time students attending schools in Vermont. College and career preparedness – Anyone who is facing growing skill challenges at work can benefit from college counseling and preparedness training to meet career goals. Foundational skill training – For students who may need to improve their reading, writing, math and computer literacy skills before attending college. English language (ESL) – Those who speak foreign languages can benefit from Vermont’s ELS classes to improve English language and literacy skills. High school equivalency – Adults who have not earned their high school diploma can earn a GED credential through Vermont adult education. Vermont’s adult education programs served more than 1,400 Vermont residents between 2016 and 2017, according to the U.S. Department of Education. To find an adult education program near you, visit the State of Vermont’s Agency of Education website.